Bioscrubbers | Biofilters | H2S, VOC Scrubber | Apzem, India. Bioscrubbers are most economical and effective method in treating some of odorous gases like Hydrogen Sulphides (H2S), Mercaptans, Organic Sulphides and some VOCs. There are certain specially grown bacteria that consumes above pollutants and makes the air free of pollutants. By growing this special Bacteria and creating an environment that encourages bacterial growth is all required for effective functioning of Bioscrubbers. Bioscrubbers has many cost advantages as well as less maintenance and also it comes with some sort of limitations like , requiring large floor space, Gas temperature and presence of other components is also critical. Bioscrubbers is mostly used in municipal waste treatment plants, odour Control at large poultry farms etc.. We provide complete customization of our entire range of Bioscrubbers to meet your exact needs. 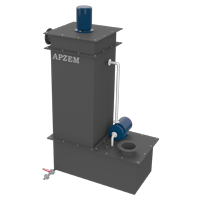 Choose any of our Bioscrubbers type below or call us @ +91-044-26580258 or send us enquiry to enquiry@apzem.com. We are very much happy to assist you in selecting and customizing our widest range of scrubber system that best suits your needs and fits within your budget.